Sweet, smokey and deliciously easy to make, these Crispy Baked Sweet Potato Fries with Garlic Aioli Dipping Sauce are exactly what you need to curb you pub-food cravings. 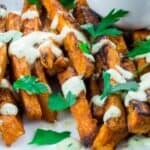 These sweet potato fries are best when eaten warm, which compliments the cool, zesty garlic aioli sauce perfectly. Just be sure to make enough, these won’t last long! You can call them whatever you want. Pub food, junk food, an occasional treat… but the truth is that fries are one of the most delicious foods on the planet. That’s right, I said it. And these sweet potato fries fall right into that category. In fact, I happen to love sweet potato fries significantly more than the traditional French fry. They’re sweet, they’re salty (or smokey, if you spice them right), satisfyingly crispy and they pack a nutritional punch that their white-potato cousins are lacking. With this recipe, you get to ditch the frying oil for a healthier (and less messy) option, the oven! You get all of the delicious flavor you’d expect from fried food without the guilt. What’s not to love? Oh man, and the garlic aioli sauce? It just throws them over the top. Let’s just say that if you’ve never had aioli sauce, you’ve been missing out. You’d never guess it, but sweet potato fries are actually pretty difficult to photograph. The main issue I had was that they kept disappearing. I’ll admit, I’m guilty of partaking in a few of the extras I made. But the dish mysteriously shrank as the shoot went on. The only people around were myself, my fiancé Andrew and our two cats. Since Andrew sincerely denies any involvement in what I like to call The Great Potato-Fry Disappearance of 2015, we’ve agreed that it must have been the cat. I’m looking at you, Fluffy. You can add any spice combination you want to these bad boys. I recommend the classic salt and pepper, but you can also try curry powder, various herbs (like basil, oregano and thyme), or spice it up with some cayenne. The spicier it gets, the more I will recommend a yogurt or sour cream-based dipping sauce. The dairy will help cool down some of the heat. 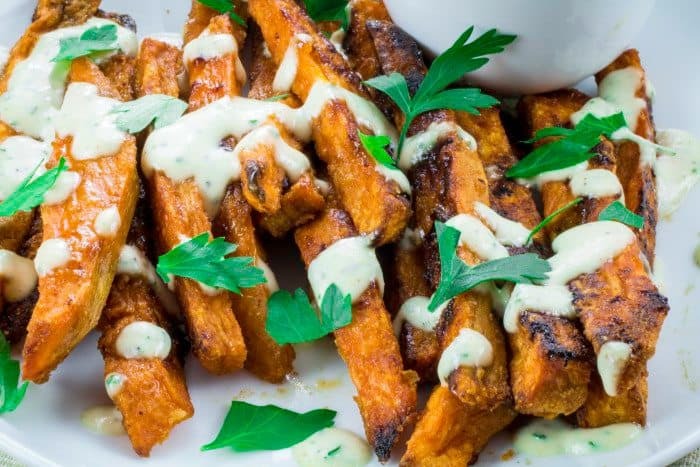 The garlic aioli sauce goes perfectly with the simple spices in this sweet potato fries recipe. Tangy, smooth and garlic-y, it’s really hard to get enough of it. I’m already planning what to do with the leftovers. Burger topping? Salad dressing? Over chicken? I may need to make more! Don’t be surprised if it makes another appearance here in the near future. So now, without further adieu, I give you Crispy Baked Sweet Potato Fries With Garlic Aioli Dipping Sauce! 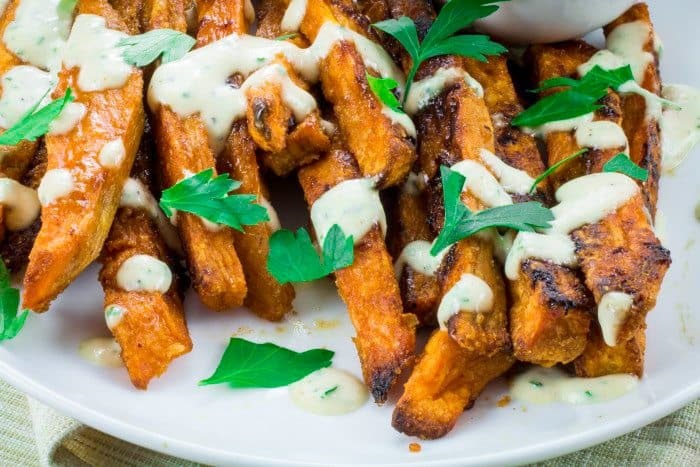 Sweet, smokey and deliciously easy to make, these Crispy Baked Sweet Potato Fries with Garlic Aioli Dipping Sauce are exactly what you need to curb you pub-food cravings. 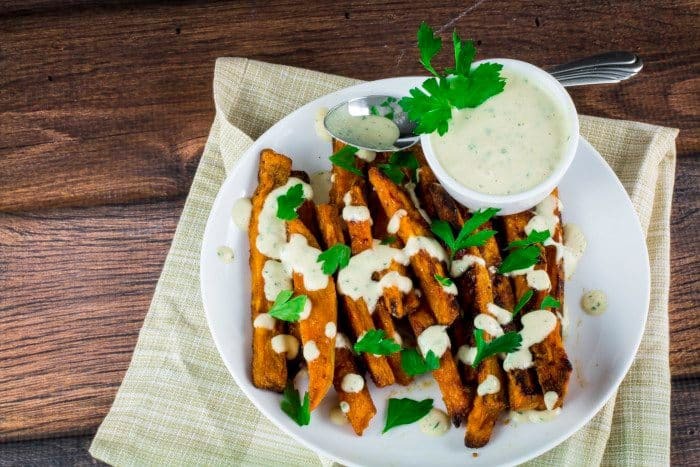 These sweet potato fries are best when eaten warm, which compliments the cool, zesty garlic aioli sauce perfectly. Just be sure to make enough, these won't last long! Preheat oven to 420°F. Line a baking sheet with parchment paper and set aside. Add sweet potato strips to large mixing bowl and sprinkle with corn starch. Drizzle with olive oil and stir potatoes until evenly coated. Season potatoes with garlic, paprika, salt, and pepper, stirring to make sure each fry is well seasoned. Add fries to baking sheet, making sure there's space between each fry. Bake for 15 minutes. Using a spatula, turn fries over. Bake for an additional 15 minutes, or until golden brown on top. Remove from oven and serve while still warm with garlic aioli dipping sauce. Add mayo, lemon juice, olive oil, garlic powder, fresh parsley, cayenne pepper, salt, and black pepper to food processor. Blend until all ingredients are mixed well together. Refrigerate for 1/2 hour (or more) and serve chilled. If you like your garlic aioli sauce extra tangy, try adding 1/4 tsp Worcestershire sauce. If I wasn’t already overdue for lunch, these would still have me drooling 😉 I love sweet potato fries but can never get them really cripsy in the oven. I haven’t doen them with cornstarch so maybe that’s the trick? My first time here Jacqui. Discovered you through linkup party. You have a great space . Fries look awesome, occasional indulgence is always welcome. Thanks! Your blog is great as well, that Avocado Chocolate Banana Milkshake looks delish 🙂 I hope you join us for more Linkups! These don’t really go with what I have planned for dinner. I’m torn between saying “I don’t care” and making them anyway and picking something for dinner tomorrow specifically so I can make these to go with it. ok, I am adding sweet potatoes to my shopping list! Cornstarch, who knew? Thanks for the great recipe, can’t wait to try them! The cornstarch definitely makes a difference! Hello! I just wanted to let you know I’ve linked your recipe on my latest post on BuzzFeed. I’m still waiting to see if it will be promoted, so it would be great if you could stop by and upvote it, and also share it on your social media!